Additional view of the inscription. An earthenware flask, which appears to have been made from two saucers attached around the rims, with a short cylindrical neck added. The flask is decorated with a blue transfer printed design of a floral border, the center with a large vase on which is perched a boy blowing bubbles from a pipe. Flasks of this kind are not common, often they have been made as a gift or presentation piece. 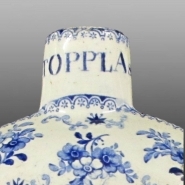 The hand-painted inscription on the neck of this example seems to indicate that it was made for Thomas TOPPLASS. This printed design is in the “Romantic” style; these light airy patterns began in the 1830s and continued adapting to popular subjects through the 1860s and later. Toplass is a very unusual name and is variously spelled, Toplas, Topplass, Toplis, and Topliss. It is likely that this piece was made for Thomas Toplass (Toplis) of Shelton and Hanley in the Staffordshire Potteries. He was born about 1828 and census records show that he worked for some time as an oven man, with the responsible job of working to secure a successful firing of a pottery factory’s wares. It is likely that at this time he would be in a position to add a personal item to the company’s commercial output. The factory that made this pattern has not yet been identified, but it was likely to be in Hanley or Shelton as the Toplass family moved house several times but never left the area. Thomas’s work as a pottery oven man probably necessitated his working unsocial hours to attend to the firing which might take several days and nights, so the closer he lived to the pottery the more convenient it would have been. When he died in 1888, Thomas Toplass left a small estate valued at £30, about £1800 in today’s money.